Scott Calvin (Tim Allen) has custody of his son Charlie (Eric Lloyd) for Christmas Eve. During the night, they hear a clatter on the roof and run outside to see what was the matter. Doing that scares Santa Claus who slips in the snow on the roof and falls off…..to his death. Scott picks up Santa’s business card which says to put on the suit and the reindeer will know what to do. He does that and unwittingly agrees to the entire Santa clause which states that Scott, by putting on the suit, will now become the new Santa Claus. He and Charlie finish delivering the presents and end up in the North Pole where Bernard (David Krumholtz) and the other elves accept Scott readily as the new boss. During the year, however, people think Scott is going crazy as he gains weight, grows a beard (which he tries to shave, but, it come back almost instantly), and otherwise acts more and more like…..errrrr, Santa. Duh…..he IS Santa, and, in the end, everyone finally gets it. 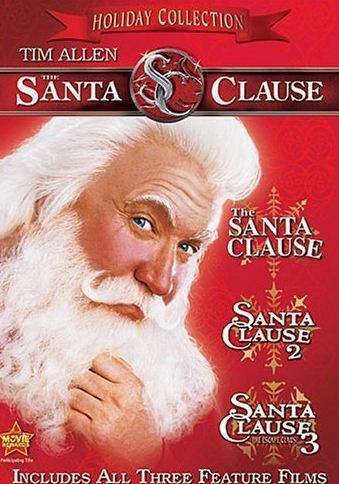 “The Santa Clause” is another yearly classic Christmas movie for us to watch. Terrific fun, if you can overlook the fact that Santa dies. Go to IMDb for more information. We watched this on ABC Family (soon to be FreeForm….wtf), but, we also have it on DVD.